On a hot summer day, the thought of sitting in a cramped kahvaltı salonu does not whet the appetite, nor does the prospect of paying a hefty hesap to eat breakfast at one of the swanky hotels that line the Bosphorus. 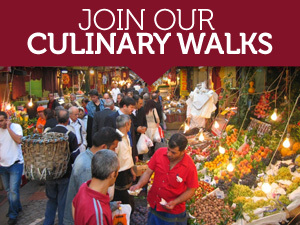 It sometimes seems that you have to travel to Bursa to eat a reasonably priced breakfast in peaceful surroundings. Thankfully, that is not the case. 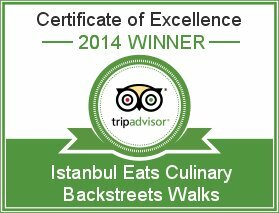 In a move that would appall the Padishah (but one we thoroughly approve of), the Istanbul Municipality welcomes the hungry masses into some of the most stunning historic Ottoman-era properties around town for an all-you-can-eat breakfast at rock-bottom prices. For 30 TL you can stand in line to gawk at the dusty furniture in the Dolmabahçe Palace Museum, or for 27.50 TL you can lounge around and eat like a king at one of eight park-side imperial residences scattered throughout the city. 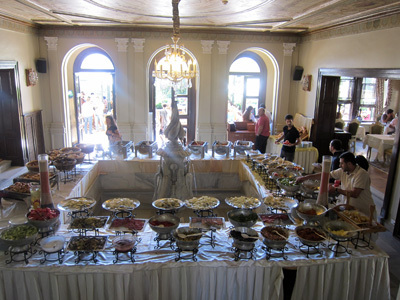 Lately, we’ve visited the Hidiv Kasrı in Beykoz and the Malta Köşkü in Yıldız Parkı, and we intend to check the other six palaces of breakfast off the list in due course. With no fewer than 60 options of cheese, eggs, jams, honeys, pastries, olives, seasonal fruits and vegetables on the buffet, no one is walking out of here hungry but, truth be told, the quality is about what you’d expect at a midrange hotel breakfast. No one item blew us away but everything was of a good standard, fresh and, of course, plentiful. The service, however, is excellent and the setting is what you are paying for, however little. In our opinion, there is no better way to enjoy the quirky interior design of Ottoman Istanbul than with an overloaded plate of menemen in hand. Some older Istanbulites may footnote this by saying it was better a decade ago, when alcohol was served at these places, but the crowd of families at the Malta Köşkü on one recent Sunday seemed perfectly content with a bottomless cup of çay. Breakfast is served between 9:30 a.m. and 1 p.m. on Saturdays and Sundays. Do you have a list / links in English of all the properties which are open for breakfast? 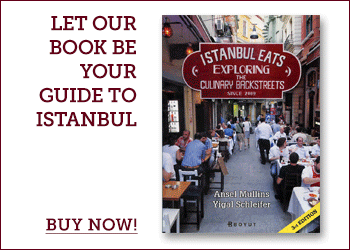 I haven’t seen it in English but here is a link to the Turkish website which has a clear listing of each place. I hope this helps.